Sassoon Docks ensconced in South Mumbai, lies almost at the Southern end of Colaba at the last lap of the Island City's Civilian zone. 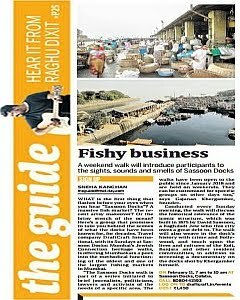 The smell of fish, the loud bargaining voices of Koli fisherwomen, the hurtling ice-bearing hathgadis and the basketfuls of fish freshly plucked and glistening adorn the city's oldest docks, build in 1875 on reclaimed land by banking and merchantile company David Sassoon & Co. The docks were originally owned by Albert Abdullah David Sassoon, son of David Sassoon, a Baghdadi Jew. 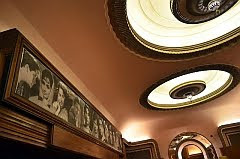 Without an early morning tour of Sassoon Docks and an adjoining trip to Koli Settlement Machchimar Nagar on 'the other side' of Colaba known for the landing spot for attackers of Mumbai's most notorious terror attack, a trip to Mumbai would be incomplete. DraftCraft hosts Lectures, Workshops, Walkthroughs, Film Screenings, Exhibitions and Shows on Sassoon Docks detailing the lives of stakeholders at Asia's oldest dock; the way they work at the boats, sell their wares in the morning, load the hathgadis with ice and heave their way through the slippery waters of the Dock, clean the jhingas (prawns) outside godowns and more. DraftCraft hosts a range of activities that include Educational camps, Legal Aid camps, Health workshops, Talks on Life Lessons for children and Safety for Women workshops at the Sassoon Docks. * If you are interested and can spend some quality time to be socially involved and network with like-minded persons sign up with DraftCraft to first get trained and then volunteer at the Sassoon Docks on weekends to work with our DraftCraft Connect team of experts and volunteers. * You could avail a DraftCraft Tour into the adjoining slums which house the Banjaras - members of a nomadic tribe from Karnataka - who primarily work in the docks and have a unique lifestyle. * You could also attend a screening of DraftCraft documentary 'In The Dock' at the Mumbai Studio of DraftCraft located a stone's throw from Sassoon Docks and partake in a discussion on Life At The Dock.